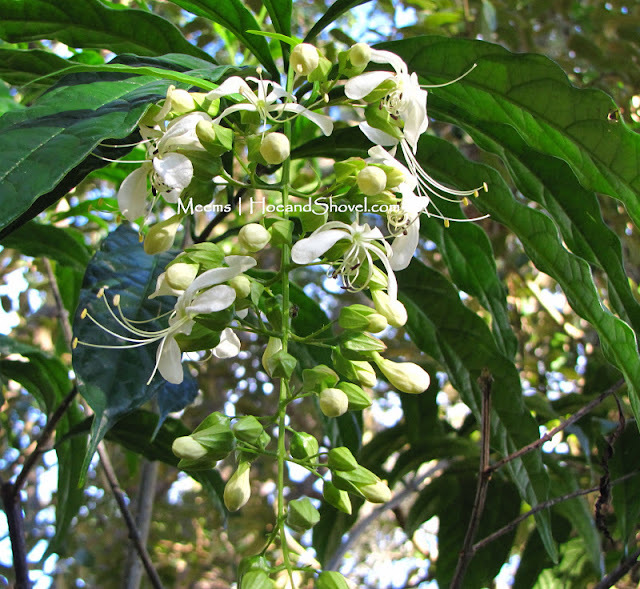 Clerodendrum wallichii or bridal veil is a pretty fall bloomer in my garden. Cascades of white pendulous flowers grace this simple shrub every autumn. My elderly neighbor gave me a cutting from hers a few years ago. They root easily. It grows in partial sun or bright, filtered light. Mine is nestled under the oak trees. 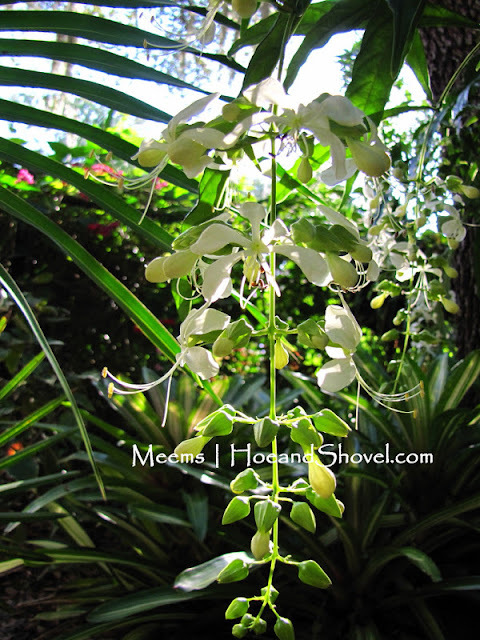 I forget about it until it blooms each year because it is a low-maintenance Florida-Friendly plant. Then, Wow! Fragrant and gorgeous. 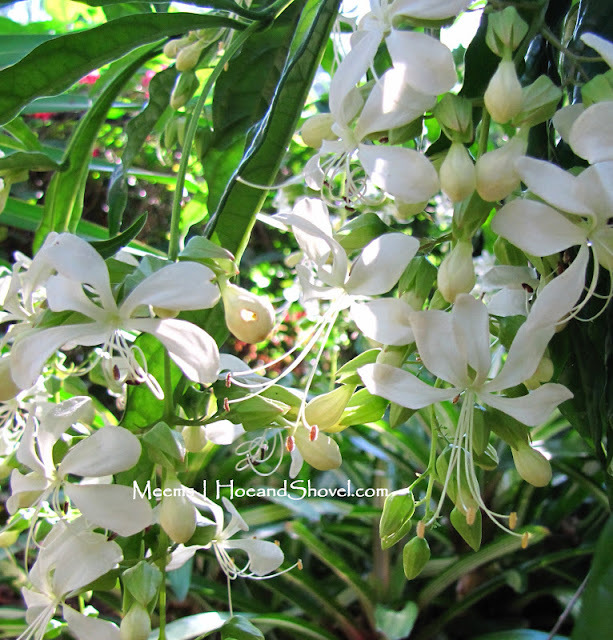 Do you grow bridal veil? *** Please click over to Hoe and Shovel on Facebook to view the daily photos and discussions about plants there. Click on the LIKE button to be part of the conversation. We'd love to hear what you have to add. Oh that is beautiful! I will be on the lookout for some. Never heard of it but now I've got another plant to add to my wish list. Do they sell it here or do you have to know someone? No, but I wouldn't mind having it in my garden, beauty and fragrance. What more could a gardener ask for? ernquet 45Yes, I have one and have propagated it several times. Blooms are spectacular. I was weeding a cutting back over the weekend and "discovered" my plant again - it is full of buds, so looks happy. 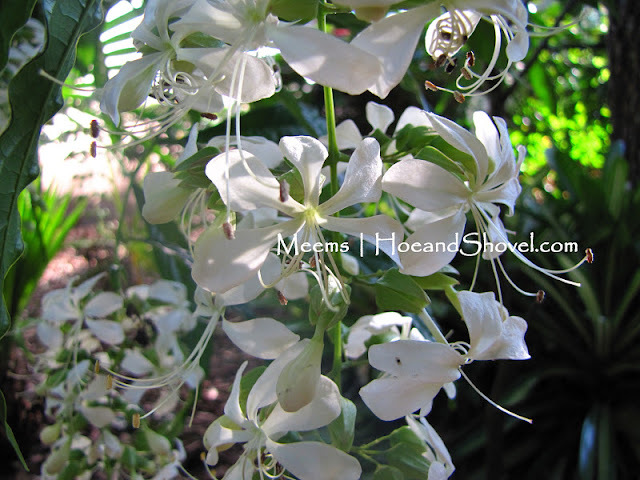 A friend gave me a cutting of this about two years ago and it flourished in my yard, growing to about 5 feet high and producing the beautiful white flowers that you showcased in your blog. But this past summer the clerodendrum wilted completely and I still have no idea what happened. It did not wilt for lack of rain, that's for sure. It was beyond recovery and I had to remove it. Still sad, because this was one of my favorite shade plants.